MINNEAPOLIS--(BUSINESS WIRE)--Sep. 10, 2015-- Select Comfort Corporation (NASDAQ: SCSS) ("Sleep Number" or "the company"), the leader in sleep innovation, is acquiring BAM Labs, Inc. ("BAM") the world's leading provider of Smart Bed Technology™ solutions and the Silicon Valley-based pioneer of biometric sensor and sleep monitoring for data-driven health and wellness. Select Comfort previously held an equity investment in BAM of approximately 18 percent and is now acquiring the remaining interest for approximately $58 million in cash. Sleep IQ(R) technology gives consumers the knowledge to adjust for their best sleep. Select Comfort knows BAM well, having partnered with the company since 2012 in the development and commercialization of SleepIQ® technology. BAM will operate as an independent business unit called SleepIQ® LABS, which will continue to be based in San Jose, Calif.
"Together, Sleep Number and SleepIQ LABS will continue to redefine and elevate what consumers can expect from their sleep experience," said Shelly Ibach, president and chief executive officer of Select Comfort. "This acquisition supports our growth and future financial performance by accelerating innovation at a time when consumers are rapidly adopting new digital tools and using their personal data to improve health and wellness." SleepIQ technology measures each sleeper's presence, movement and average heart and breathing rates, and analyzes the data with a proprietary algorithm to provide consumers with an individual daily SleepIQ® score and supporting data. Unlike data from other devices, this knowledge is complemented by the ability to make adjustments to the firmness of each person's side of the bed – their Sleep Number® setting – for optimized sleep. Consumers have quickly adopted SleepIQ technology as part of their daily life and are using this personal data to improve their sleep, and therefore their overall health and wellness. Commenting on the merger, Rich Rifredi, co-founder and chief executive officer of BAM said, "We share Sleep Number's passion for innovation and dedication to its mission to improve lives. 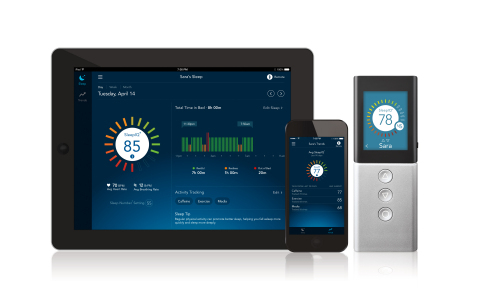 Sleep Number will provide extensive consumer expertise and resources as we further develop smart, connected biometric solutions that improve sleep and wellness." "We are very excited to work even more closely with SleepIQ LAB's team of talented engineers as we continue to innovate with sleep data and insights in support of our mission of improving lives by individualizing sleep experiences," said Annie Bloomquist, senior vice president and chief product officer of Select Comfort. "This acquisition strengthens our intellectual property and our competitive advantages." Select Comfort also announced today that it has obtained a new $100 million senior secured revolving credit facility, though it does not expect to draw on the facility for the acquisition, which is expected to close in the third quarter of 2015, subject to customary closing conditions. The acquisition is not expected to be dilutive to the company's full year 2015 earnings per share (EPS), and is expected to be accretive to EPS within two years. Select Comfort is being represented by the Palo Alto, Calif. law firm Wilson Sonsini Goodrich & Rosati, the Minneapolis-based law firm Oppenheimer Wolff & Donnelly LLP, and is also being advised by Citigroup Global Markets Inc.
SLEEP NUMBER, a sleep innovation leader, delivers unparalleled sleep experiences by offering high-quality, innovative sleep products and services. The company is the exclusive designer, manufacturer, marketer, retailer and servicer of a complete line of Sleep Number® beds including our newest addition, the SleepIQ Kids™ bed. Only the Sleep Number bed offers SleepIQ® technology – proprietary sensor technology that works directly with the bed's DualAir™ system to track and monitor each individual's sleep. SleepIQ technology communicates how you slept and what adjustments you can make to optimize your sleep and improve your daily life. Sleep Number also offers a full line of exclusive sleep products including FlexFit™ adjustable bases and Sleep Number® pillows, sheets and other bedding products. Consumers also benefit from a unique, value-added retail experience at one of the more than 470 Sleep Number® stores across the country, online at SleepNumber.com, or via phone at (800) Sleep Number or (800) 753-3768. Founded in 2006 by Rich Rifredi and Steve Young, BAM Labs is the world's leading provider of Smart Bed Technology™ solutions and partnered with Sleep Number in co-developing SleepIQ technology, which is available on all Sleep Number beds at every price point. In addition to powering Sleep Number beds, BAM Labs has a growing presence in the medical smart beds market. BAM Labs' FDA registered Touch-free Life Care™ (TLC) smart bed sensor transforms any bed into a smart bed to inform, manage and improve health. This news release contains forward-looking statements, which are being made pursuant to the safe harbor provisions of the Private Securities Litigation Reform Act of 1995. These forward-looking statements are based on management's current expectations of future events, and often can be identified by words such as "expect," "anticipate," "continue," "plan," "estimate," "project," "believe," "should," "could," "will," "would," "possible," "may," "likely," "intend," and similar expressions or future dates. Some of the forward-looking statements in this release about Select Comfort's acquisition of BAM Labs include the anticipated timing of closing of the acquisition, anticipated earnings impact and plans regarding future operations. Forward-looking statements involve risks and uncertainties that could cause actual results to differ materially from those projected or implied. The following are some of the factors known to Select Comfort that could cause Select Comfort's actual results to differ materially from what Select Comfort has anticipated in its forward-looking statements: delays in completing the acquisition of BAM Labs and the risk that the acquisition may not be completed at all; the failure by Select Comfort to achieve the net sales, earnings, growth prospects and any cost synergies expected from the acquisition or delays in the realization thereof; delays and challenges in integrating the business after the acquisition is completed, including risks associated with information or financial systems; operating costs and business disruption during the pendency of and following the acquisition, including adverse effects on employee relations or business relationships with third parties; unanticipated liabilities or exposures associated with BAM Labs' business for which Select Comfort has not been indemnified or may not recover; general adverse business, economic or competitive conditions; and other risks and uncertainties described in our most recent annual report on Form 10-K, subsequent quarterly reports on Form 10-Q, and other filings with the Securities and Exchange Commission. We undertake no obligation to update forward-looking statements made herein to reflect events or circumstances after the date hereof.